Plenty of change pioneers and business guru books litter management book shelves. For successful change management surely all that is necessary is a reread or simple follow-through on proven wisdom or paths traveled. 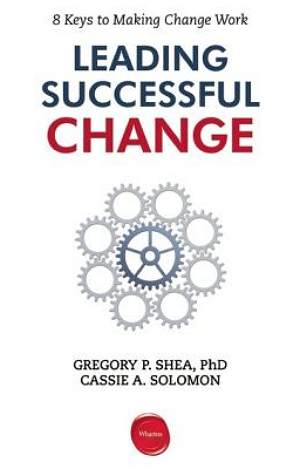 Below is this blog’s review of the book Leading Successful Change, 8 Keys to Making Change Work by Gregory P. Shea, PhD and Cassie A. Solomon. Other’s may write, speak, talk, and sell any number of change management solutions and it is not for a lack of commitment that change fails, but without behavior and environment involved, change efforts continue to chart troubled waters. Professionals who practice or enter into change management are presented a very tight book and busy executives who want answers get their answers within the accumulated 106 pages. From there out, I believed, I had a strong sense for their approach. As an Appreciative Inquiry organization design practitioner they had my interest at behavior change. A casual observer of this blog or my work knows my approach follows systems, people and technology, and a future-state design of what could be. Business examples are introduced quickly, remember, at a pithy 106 pages, this book does not dawdle. I found the definitions and supporting examples in practice highly credible and with sufficient depth for context. 8 levers are presented to support behavior and environment change. Their key for your change success: at least 4 are needed for change success. The implementation approach is logical and sound. You can plan change efforts to account for any or all of the 8. Also, keep in mind for planning a quality change approach needs at least four of those eight. The executive sniff test is met. Credible examples support the way a change agent would have to present a business case to an executive. There are professional libraries full of wise change management books; professional change management speaker circuits; corporate change departments; change consulting service offerings; and entire professional change management service companies, but without behavior and environment conditions addressed, proceed at your own peril. Change requires doing something different. Doing something different, in practice, is not as simple as a process chart or printed word. My treasure trove of certifications, books, lectures, magazines, and blogs that support my education, training, and profession point out Shea and Solomon are correct. 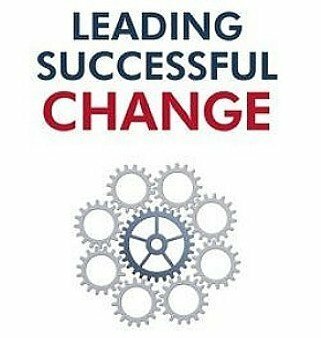 For anyone working hard for change success you may only need this book. Disclosure: I received a review copy of this book from the publisher via NetGalley. This review is my opinion and no compensation was provided. Sounds like a great book. I’ve always got things that need to change. I shall pop by Amazon next to check it out. Very good read and cuts right to the chase. As I mentioned above, I read it on Kindle so had no idea how big or long the book was and when I finished I wondered if this was just a promotional copy as it was so short. Not much extra time all around so a book that cuts right into it is welcome and there is plenty to plot and plan for within. Hope you enjoy it and do follow up with any thoughts. Thank you for posting Cole, I really enjoy your the web tips from your site – very clean design, as well.